"This is like your second home in the Cotswolds!" I quipped. We have cooked for the same family 2 or 3 times a year ever since Wellacres opened in 2007 - it's so good why go elsewhere? They are also the parties we look forward to - always a fun evening! This time round they really went the whole hog. Well, suckling pig anyway - as one pig will suit a smaller party. Scallops, tiger prawns and salmon with vegetable noodles, ginger, herbs & whisky - you open at the table so you get all the aromas - see more here. As I was making these there was a heated rummy then blackjack game going on between mother and daughter, everyone gathered round the kitchen table. The previous suckling pig roast we had served had been supplied by the farmer who reared them in his spare time. He had suggested subbing the scored skin with vinegar as well as salt overnight to make the best crispy crackling. So I tried this this time - certainly looked good, but so busy never got round to trying it. After slicing I served it on a large platter at the table. The accompanying vegetables - sautéed savoy cabbage & caraway seeds, rosti potato and french beans wrapped in pancetta were plated. The night before de-boned, the leg, belly and shoulder meat reserved for stuffing the next day and the skin scored , dried and seasoned with salt and vinegar. Only after bit of persuasion from the male guests to the rest of the party was the pig allowed to be served at the table - it all adds to the theatre of the meal! Can't decide between cheese and dessert? Why not have both. On the same plate! They liked it so much last time around they asked for the same thing for this meal. Blacksticks Blue cheese and mulled wine jelly - this was so popular last time we did the same thing again (just with double the amount of gelatine in the jelly which makes it easy to cut). 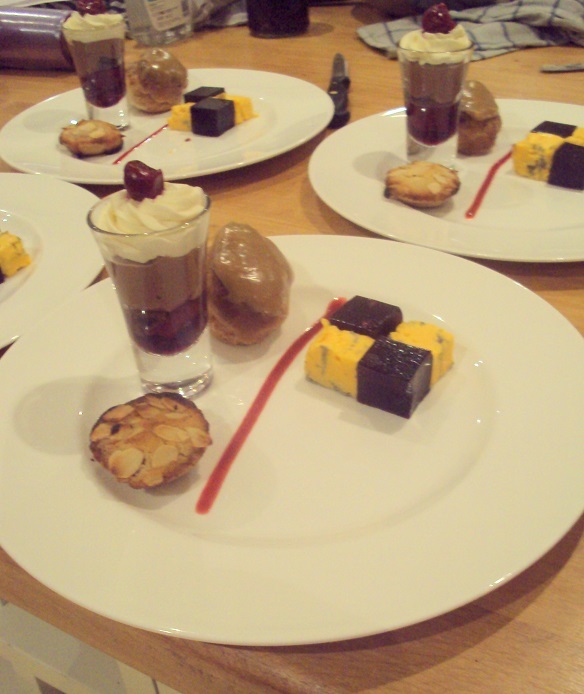 Everyone was choosing their favourite dessert - as we hear so often, well at every assiette of dessert we serve. I think each of the items got at least one vote! Just can't wait till the next one now. What's that to be? 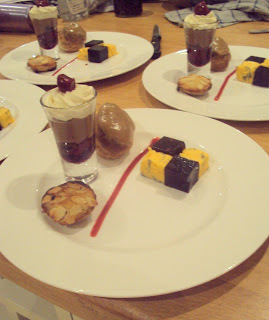 I was trying to suggest the idea of the cookery events we do - see how its done. Wellacres is the prefect venue for that. Now that would be an evening to remember too.